Polyaniline (PANI) thin films modified with platinum nanoparticles have been prepared by several methods, characterised and assessed in terms of electrocatalytic properties. These composite materials have been prepared by the in situ reduction of a platinum salt (K2PtCl4) by PANI, in a variety of solvents, resulting in the formation of platinum nanoparticles and clusters of different sizes. The further deposition of platinum clusters at spin cast thin films of PANI/Pt composites from a neutral aqueous solution of K2PtCl4 has also been demonstrated. 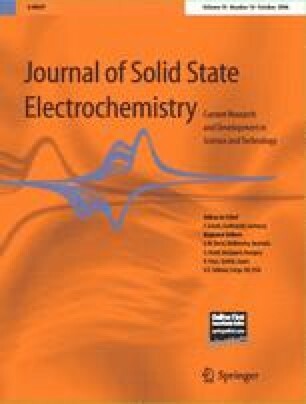 Thin-film electrodes prepared from these materials have been investigated for their electrocatalytic activity by studying hydrazine oxidation and dichromate reduction. The properties of the composite materials have been determined using UV–visible spectroscopy, atomic force microscopy and transmission electron microscopy. The nature of the material formed is strongly dependent on the solvent used to dissolve PANI, the method of preparation of the PANI/Pt solution and the composition of the spin cast thin film before subsequent deposition of platinum from the aqueous solution of K2PtCl4. Dedicated to Professor Dr. Alan Bond on the occasion of his 60th birthday. We thank the EU Human Potential Programme SUSANA (Supramolecular Self-Assembly of Interfacial Nanostructures), contract HPRN-CT-2002-00185 for the funding. We are especially grateful to Steve York (Department of Physics, University of Warwick) for the TEM images.